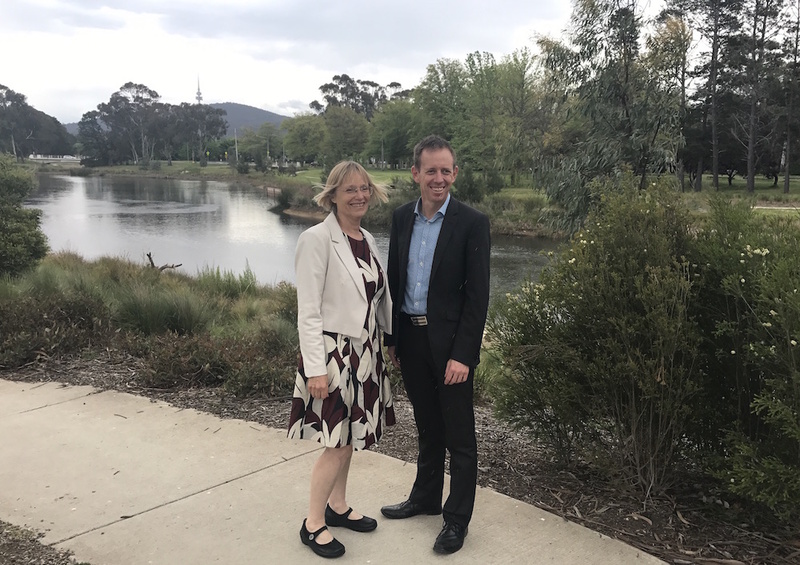 Shane Rattenbury will be a minister in the Labor-Greens government and the Greens will support Labor’s Joy Burch becoming Speaker of the Assembly under a new 16-page parliamentary agreement signed today by ACT Chief Minister Andrew Barr, Mr Rattenbury and his Greens colleague Caroline Le Couteur. Read the full agreement here. All 25 MLAs will be sworn in during a ceremonial sitting at the ACT Legislative Assembly tomorrow, after which Mr Barr will allocate portfolios to Labor MLAs Yvette Berry (the likely Deputy Chief Minister), Meegan Fitzharris, Mick Gentleman, Gordon Ramsay, Rachel Stephen-Smith, himself and to Mr Rattenbury. Among notable initiatives in the Greens-Labor Parliamentary Agreement are a reduction in the number of pokies licences in the ACT from 5000 to 4000 by July 2020; the expansion of cat containment programs; an end to ACT Government subsidisation of the greyhound racing industry (the two parties will “actively support the transition steps required to end the operation of the greyhound racing industry, including animal welfare and training support”); an end effective immediately to Labor and the Greens accepting donations from property developers with future legislation to ban all such donations; and the establishment of a Parliamentary Committee inquiry into the most effective and efficient model for an ACT Independent Integrity Commission that will be set up and “broadly structured on those operating in similarly sized jurisdictions” following the inquiry. Mr Barr said he anticipated the inquiry process would take approximately 12 months. The planning measures set out in the agreement include the establishment of an Assembly Committee Inquiry into planning to recommend amendments to the Territory Plan, ways to improve the planning process, consultation requirements, design and sustainability outcomes, energy performance and a range of housing options; strengthening of community consultation processes and the active progression of discussions with the NSW Government and Yass Valley Council regarding moving the ACT/NSW border in West Belconnen. Under the agreement, Labor will support the Greens’ nominations for chair of the Standing Committee on Planning (Ms Le Couteur) and for chair of the Select Committee to Establish an Independent Integrity Commission (Mr Rattenbury). Both parties had to compromise during the negotiations, with the Greens having some wins on gambling sector reform but not others, while Labor had to more than triple its proposed spend on active travel initiatives such as footpath and cycleway improvements to a total of $30 million. Mr Rattenbury acknowledged his party would have preferred to see specific initiatives around reducing harm from gambling such as $1 maximum bets and mandatory pre-commitment included in the agreement. “The Labor Party are not ready for that yet,” the Greens Leader said. “We have set in train processes to continue to work on that, but we are in a situation at the moment where we are only two votes out of 25 in the Assembly for these measures. The parties did agree to increase the Problem Gambling Assistance Fund level from 0.6% of gross gaming machine revenue to 0.75%. On the environment front, the ACT Environmental Defenders office will be funded for at least two years from next month with the Government working with that organisation to develop sustainable wider revenue streams. Some 100 recycling bins will be installed around the city, too. 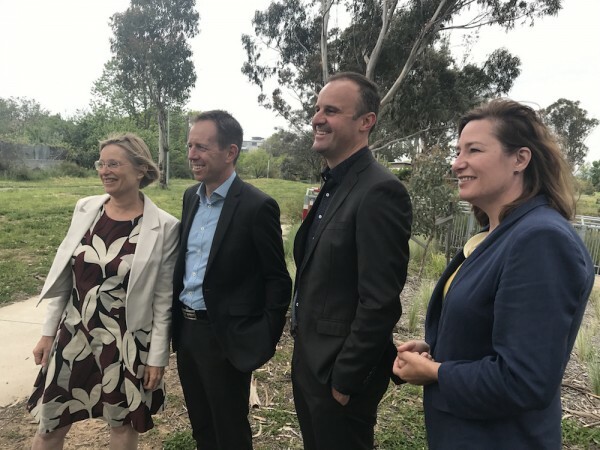 The Government will undertake a feasibility study into establishing a new northern Canberra region National Park, including existing nature reserves around Mount Majura, Mount Ainslie and Mulligans Flat. Labor and the Greens will also roll out “micro parks” in urban areas and establish an “adopt a park” scheme to increase usage of local open spaces. They will implement free bus travel for seniors and concession card holders (excluding students) and design, construct and commence the operation of three nurse-led walk-in centres, in Gungahlin, Weston Creek and the Inner North. ACT Chief Minister Andrew Barr said the agreement was not an exhaustive list of everything the Government would undertake during the next term, and that some compromise, for example in terms of timeframes, had been required to reach agreement on its contents. “What it does represent is a commitment to shared values, shared outcomes and a shared agenda,” Mr Barr said. The Chief Minister said both parties would continue to pursue other initiatives in accordance with their respective election commitments and party platforms. Mr Rattenbury said the agreement provided a sound platform for government over the next four years. “The Greens are particularly pleased to have secured the Labor Party’s support for an Office of Mental Health, more funding for walking and cycling, and a drug and alcohol court,” he said. Ms Le Couteur said she was happy that the parties had agreed on policies around increased affordable housing and reform to the planning system. “This Parliamentary Agreement is just the starting point of our work together to make sure progressive voters’ voices are heard in the Assembly over the next four years,” she said. Under the agreement, Labor must provide the Greens with at least a week’s notice of any changes to ministerial portfolios . The document also states that the Greens minister will vote with the Government in the Assembly on all matters that he has agreed to support in Cabinet. If he is plans to move amendments, advocate a different position during debate or vote against a proposal, he must excuse himself from further Cabinet discussion on that proposal. He is entitled to explain his position publicly in such circumstances. The Greens agree not to move any motions of no confidence, or support any other party’s non-confidence motions, except in instances of proven corruption, gross negligence, or significant non-adherence to the agreement or Ministerial Code of Conduct.